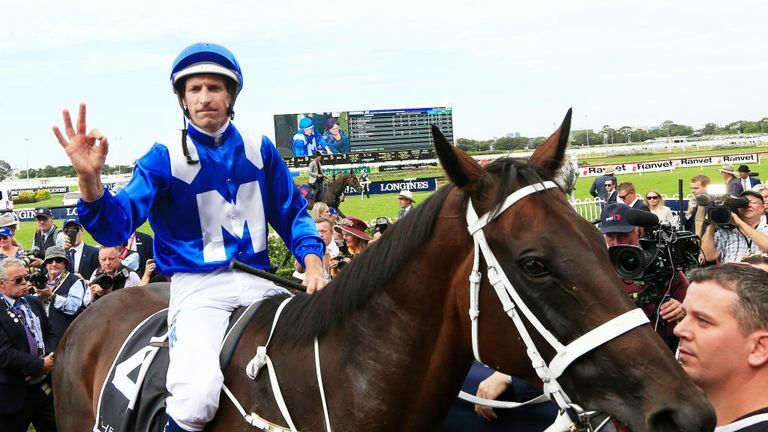 Winx extended her winning streak to 32 on Saturday with a fourth victory in the George Ryder Stakes at Rosehill in Sydney. Waller is certainly not anxious about the wet track said that Winx heads to Rosehill in first class order following her two Sydney Autumn Carnival wins at Randwick in the Group 2 $250,000 The Star Apollo Stakes (1400m) on February 16 and in the Group 1 $600,000 Chipping Norton Stakes (1600m) on March 2. She is the first horse to do many things including winning the same three Group One races four years in a row - the Cox Plate, Chipping Norton and George Ryder. Trainer Chris Waller was trying to leave sentiment aside during their preparations for Winx's final run at Rosehill earlier this week. "About half-way down the straight we were pretty confident that she was going to go on with it". Just a marvellous horse to work with, marvellous to have her in. Winx eclipsed Dreamforce and Brutal to secure the win. "Obviously I was more assertive with her over the last 300 metres than I would be here early in the mornings but for her it was very comfortable". "But for her it was really comfortable and when I asked her to really stretch she responded and you could hear the crowd roar". Winx is expected to race for the final time at Randwick on April 13 where she will again start favourite in the Queen Elizabeth Stakes.